Dr. Nitya Prakash was born on 19th of February in the year 1988 is a film writer and author from India. He writes in the genre of banking, general fiction, paranormal, and romance. In the year 2016, he has been awarded “Karmaveer Puraskaar.” This is the award which given to any individual because of his/her contribution to leading change. It is not given to any organization. “St. Thomas School” was the school from which he has completed his schooling in the year 2006. It is situated in Lucknow city of U.P. (Uttar Pradesh) state in India. He has an experience in many sectors like retail, financial services, banking, etc. 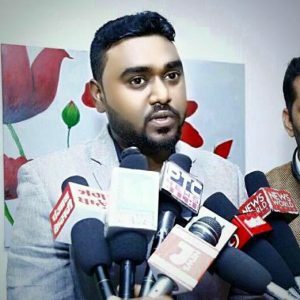 After that, he has completed his graduation in Bachelor of Computer Application (BCA) from Lucknow University in the year 2009. Later on, he went to ICICI Manipal Academy, Bangalore in the year 2011 to complete his degree of Post-Graduation Diploma in Management (PGDB). In the year 2016, By Los Angeles Development Church Institute situated in California, United States, he was awarded Honorary Degrees for his contribution in the field of life coaching and literature. In the year 2016, from Kalinga University, he has completed his degree of Master in English Literature. Kalinga University is situated in Raipur. Nitya Prakash is the founder of The School of Wheels India and Dronacharya India. His debut book name was “Dear; I Hate you” which was released in the year 2011 in the genre of semi-fiction. Currently, he is busy in writing his next novel named “False in Love.” Currently, he is 29 years of age. Along with being an author and Novelist, he is also an Entrepreneur and a Banker. He was born in a middle-class family of Brahmins. His parents have six children in which he is the youngest one. He also has his website named www.nityaprakash.in.